It seems that every day I’m helping some blogger friends with questions related to blogging, SEO, marketing, monetization, etc. As much as I like to help people, I only have so much time. So a lot of times I’ll base my weekly blogging tips post on a specific question that someone asks me about via e-mail. This week’s question was from a blogger friend of mine who runs The Passive Income Earner. He was curious as to my opinion of how to properly use tags, categories and meta keywords. While I already answered his question via e-mail, I figure I should share my opinion with all of you in case you weren’t sure about this either. Now before I get started talking about this topic, you should know that I have only been seriously blogging for about 15 months now. So a more seasonable blogger may have differing opinions, but I think I have a pretty good idea of how search engines would view such elements. 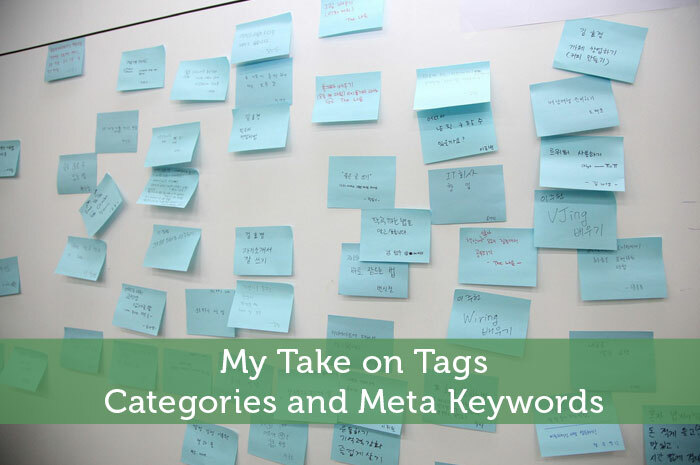 What’s the Deal on Tags, Categories and Meta Keywords? I admit this is an area that I have personally done a lousy job on my blog to this point. My posts could definitely be better grouped into more relevant categories. I smell a future project for my assistant. Depending on your blog’s navigation setup, your category setup may be the most important type of post classification. Many blogs have links to each of their categories in their sidebar or have a drop down menu to jump to specific categories. So if you want to help your readers find content that interests them, you really should have a well thought out category organization. If your category list is linked in your sidebar, I would advise against getting carried away with too many categories. Giving too many options just creates an overwhelming list that is tough to go through. Not only is that not user friendly, but it also might not be SEO friendly. If you have too many links on each of your pages, search engines might not follow all of those links creating internal PR distribution issues. It’s a good idea to keep each page to under 50 links total. Some people recommend under 100 but I feel that is spreading yourself too thin and would likely be cluttered. So how you approach categories really depends on how your blog’s navigation is setup. If you use a drop down menu for category navigation, you can probably get away with using more categories. Also consider how many posts would fit into each category to determine if some categories may not be necessary. This does create challenges when setting up categories while your blog is relatively new. That’s my excuse anyway. This is probably the classification element that a lot of bloggers aren’t quite sure how to use effectively. Essentially they are more specific categories, but you can get away with using a ton of different tags. They are also useful for blog navigation as a reader might be interested in more posts related to that specific topic. Because of this, you should be careful about creating too many tags that only apply to a single post. That would create less than ideal navigation. The big benefit of both categories and tags is the potential to create internal links from very relevant pages. Search engines give more weight to links when the pages have your keywords in places such as the url, title and headings. Since they also give more weight to links from pages that have more links pointing to them, you should again try to avoid tags that won’t be used again. You should be careful with tags since they have the potential to get rather spammy. Think of how it would look if you entered a large number of tags that are fairly similar. Search engines are going to see a lot of tag pages that have nearly identical content other than the keyword it is optimized for. This used to be a fairly popular black hat SEO strategy, but search engines have since developed ways to combat it. Top search engines can even detect synonyms to get a better idea of when this tactic is used. Some bloggers choose to block search engines from indexing tag pages and/or categories, which might be a good idea if you are unsure of how to use them safely. Personally I let them index all those pages with the assumption that it is not in their best interests to penalize all blogs that make use of those features. I don’t want to lose the benefits out of paranoia. The other thing to keep in mind is that you should avoid using your category names as tags. This would create pages that are extremely similar, much more so than using many synonyms within tags. For my blog I will need to deal with this when I setup a better category system. These days I’m not too concerned about this html element. In the early days of SEO it was extremely important as search engines were a little too trusting in letting website owners tell them what page should be relevant for. After years of spam, meta keywords became almost obsolete. Some lower end search engines may still use them as a minor factor for rankings though. So if you really want to cover all your bases, you might as well use this html tag. Since the meta keywords are not visible on your page, this is where you can use synonyms and phrase variations. Beware that using any words excessively might still hurt you SEO-wise. If you do use this tag, I suggest you stick with your most important keywords only, particularly ones that you want to rank well for. Anything too broad might be better as a tag instead. For my own blog I have it setup to default to using the tags as my post meta keywords. If it is a particular important page I do put a bit more effort there. I wouldn’t waste time worry about it though. Just set and forget. Really these ways of classifying your posts isn’t anything complicated, but there are some things to be careful with. Remember that if you aren’t satisfied with your current setup, you can always go back through old posts and refine classifications to keep search engines and readers happy. With that approach the only thing to worry about is emptying out existing tags or categories since that results in some page-not-found errors. Search engines don’t like that kind of sloppiness. So look into setting up page redirects if that situation arises. Maybe that’s better to cover in another post. Does anyone have any questions about these elements? Was anything I mentioned in this post new to you? I like the websites that have a few categories in the header so you can easily access the most popular posts. I am thinking about doing that on my site, it is easy if your posts are already categorized properly and helps improve your stats if people stay a while more. I completely agree. It’s something I need to work on myself since I’m sure it’s not very easy to find specific posts otherwise. Anything you can do to help your visitors find more content on your site is a positive thing. I actually manage the header myself and I don’t use the categories for that. I found that using the categories, I had little control on the layout and what I wanted those pages to be. I used my header as a guide on very specific topic. In my case, the only person that see categories is Google when indexing. I am surprised by what Google indexes sometimes. I always struggle with the categories issue and keeping balance with that. Like Pauline, I like when sites have a few in their header so it makes it a bit easier to navigate and find what I want. That said, my difficulty is determining what to do with those posts that really do not fit in any of the categories I have in the header. As the site gets older I see that I am writing about so many different things that a number of them really do not fit in any of my selected categories. That is probably a pretty common issue. That’s where some nested navigation might help out. You don’t necessarily need header/sidebar navigation to very minor categories though. Just think in terms of what is most useful to visitors and search engines. Quality timing on the article. I am currently going through my category structure to cut it down a bit. I think I have gotten a little out of hand at first and that is not good. Good luck cleaning that up Grayson. Remember to redirect any category urls if you drop any completely. I think every blog should re-analyze their category structure after the first year or so. Great description of all of those things Jeremy. Categories and tags are something that I have never known how to use properly, so this gives me a good framework to work from. Definitely try to plan out a best approach for these elements with your blog going forward. That might change over time, but if you follow your blueprint early on there is a lot less to go back and change afterwards. Is there a good strategy for going back and re-classifying/categorizing things? I have over 100 posts, and it would take FOREVER to optimize them all. My tags and categories are scattered, and not very good or SEO friendly. Maybe writing down 10 categories that can encompass everything? Also, still not sure what a meta keyword is…? Is it in the Yoast plugin somewhere? I’ll be figuring that out myself soon. I’ll likely just go through posts manually and change them. It might take a few hours but the better organization will make it worthwhile. 10 categories is probably a good number, but it depends on how you are going to link to those. Meta keywords might not be accessible with the default setup of wordpress but you can manually set them with Yoast or All-In-One SEO. Thanks Jeremy. I’ll probably just set aside an evening to dive into this. SEO is probably holding me back from some serious growth at this point, as I seem to have plateau’d in traffic as of the past few months. My categories are all over the place. I could really stand to cut them down. It’s really something I never quite understand. Thanks for the info. It’s probably about time to look into cleaning that up soon before you put up more posts that might need reorganization. If anything is still unclear, shoot me an e-mail. I’m actually going the other way with categories by creating more of them. As my blog has gotten more focused, the categories I had started to feel too broad. A person finance site with a category of personal finance? That approach makes some sense as a blog grows, but be careful how you link to those categories. I really don’t like when I see a blog with a list of 20+ categories in the sidebar. It just looks cluttered and is not user friendly. Instead I suggest linking to your main categories in the header or sidebar and using a drop down form to get to the rest. Yes, that is what I’m doing. Especially since there are some posts that I just have trouble describing as personal finance. So all pf posts are in sub-categories to the pf category. Thanks for yet another post in this series Jeremy! I’ve finally started working through all of your posts in this series and I’ve learned a lot! That’s good since that’s what this series is for. Maybe I’ll eventually compile all of the posts into an ebook. With Google they are anyway. It has been that way for quite some time now. Other search engines may use it to some degree but not as a major factor. If anything they might use it more to weed out spam. Tags are always something I struggle with. I usually feel unimaginative and half the time don’t have a list of what tags I’ve used in the past. I have to start typing something and see if it tries to auto-populate anything. Good tips, I’ll try not to use too many synonyms. If you aren’t already providing a lot of high quality content in your area of expertise, now is the time to start. This isn’t a license to throw up a bunch of garbage and hope the engines like it. Ease of use seems to readership scores more than most things, perhaps second to content, even. Good point about categories.